This three-dimensional model of the human skin has been enlarged 75 times. It is so comprehensive in its coverage of subjects that it has been called six models in one. The front face compares and contrasts normal healthy skin from three different body regions: the palm or sole (totally hairless) the axilla or armpit (sparsely endowed with hair), the scalp (completely hirsute). The epidermis, dermis and hypodermis, as well as the glands, hair follicles, nerves and receptors are all sculpted in full relief with contrasting colors. 46 features are identified in the accompanying key. 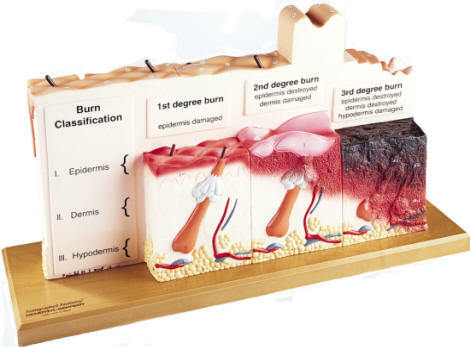 The back face shows the progressive severity of injury caused by burns - from the reddening and transitory damage of the first-degree burn, the blistering, often permanent damage of the second-degree burn, to the deep charring and permanent tissue destruction of the third-degree burn. Burn segments are fully labeled directly on the model. Measuring 16 x 3 x 10 inches, the model is mounted on a 6 x 18 inch hardwood base. 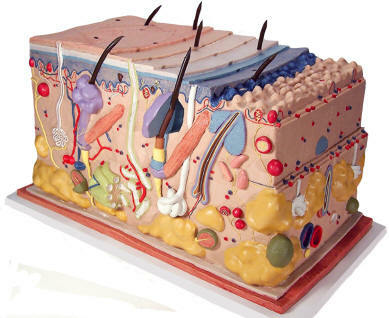 This unique model of the skin shows a section in three- dimensional form. 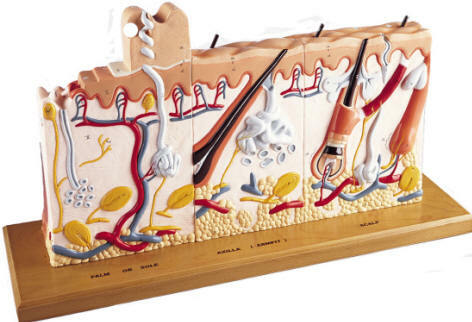 Individual skin layers are differentiated and important structures such as hair, sebaceous and sweat glands, receptors, nerves and vessels are shown in detail. Mounted on baseboard. 44 x 24 x 23cm.